Sri Krishnadevaraya University, Anantapur issued the AP Law Common Entrance Test (APLAWCET) 2017 and AP PG Law Common Entrance Test(APPGLCET) 2017 notification in February, 2017. The University invited the applications from the eligible students through online mode for admission into 3 or 5 years law courses(LLB) through APLAWCET and admission into LLM courses through APPGLCET offered by state universities in AP State including their affiliated colleges for the academic year 2017-18 from 18-02-2017 to 18-03-2017 as per its schedule. The candidates, who were applied for this entrance tests, they were attended the law entrance exam 19-04-2017 and results announced on 25-04-2017. 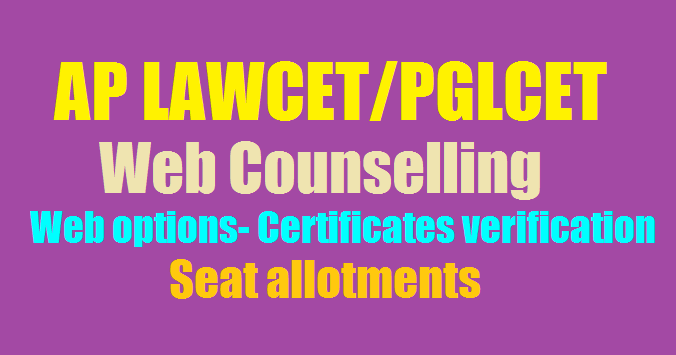 Now the LAWCET 2017 qualified candidate are waiting for their LAWCET counselling dates(schedule) for admission into law courses. Candidates must attend for AP LAWCET 2017 Counselling Rank wise as we are given. Documents verification is done by officials. Candidates need to register at the time of Counselling with required details. Sri Venkateshwara University officials announced the AP LAWCET / AP PGLCET 2017 Counselling dates on September 3rd, 2017 through press media. The certificate verification in Helpline centers will commence on 21/10/2017. For more details like Detailed notification, List of Help Line Cneters, detailed procedure of web based counseling, admission procedure and list of colleges are available at official website. So the candidates who are qualified in the entrance test 2017 are ready for this LAWCET counselling 2017. Candidates should collect all the required certificates and documents for this counselling. these websites before they go for Certificate Verification. Caste Certificate etc. issued by competent authority and also CAP/NCC/PH/SPORTS /Minority Certificate (SSC TC containing Minority Status or Certificate from the Head Master ) if applicable. 2. Tuition Fee particulars and seats available under Convenor Quota College wise will be made available on the website https://aplawcet.nic.in www.apsche.org and www.skuniversity.ac.in well before the commencement of Option Entry. However Candidates claiming NCC/CAP/ SPORTS/PH have to attend in any one of the helpline centers as indicated below. Verification of Certificates of the Candidates for PH/CAP/SPORTS/NCC categories will be done at Acharya Nagarjuna Univirsity, Guntur only on the dates mentioned along with other certificates. CAP- Certificate issued by ZillaSainik Welfare Officer (In case of Ex-Service men) Identity card and Discharge book for verification. Candidates whose parents are domicile of Andhra Pradesh are only eligible to be considered under “CAP” Category. NCC, SPORTS to produce Original Certificates issued by competent authorities. PH candidates shall produce disability certificate issued by Medical Board. Candidates with 40% disability or more alone are eligible for consideration under PH reservation. The decision of the verifying authority is final in respect of above special reservation categories with regards to priorities fixed.